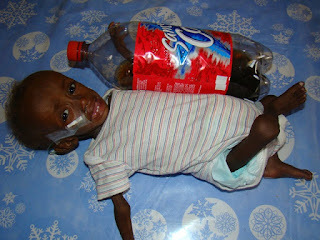 A 13-month-old Haitian boy who weighs 5 pounds. God drew my heart toward Haiti just 3 days prior to the earthquake. I didn't know why, but now I do. I had NO clue how bad things are for Haitians. I had NO clue of how bad things were PRIOR to the earthquake, much less what things are like now for Haitians. This 13-month-old boy who weighs 5 pounds didn't get this way from the earthquake. 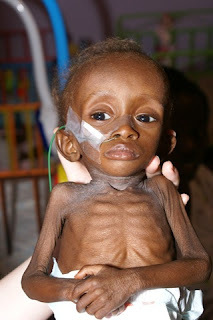 He was suffering of malnutrition far before the earthquake ever hit. I won't get into a sermon about Haiti here. If God lays Haiti on your heart, He will open your eyes to the painful truth of life in Haiti. I would love for you to join me in prayer for the people of Haiti. I've learned far more than my mind can handle about Haiti. It is hard to live our comfortable American life knowing there are people all over the world suffering more than we can even begin to fathom. Today Haiti is heavy on my heart...and it's been this way since January 12...and I'm afraid it's not going away anytime soon. Give .30 cents to feed a Haitian a healthy meal along with the gospel! Give a $5 Donation! to offer Eternal Hope to Haiti! I feel EXACTLY the same way! We are in the process of adopting from Bulgaria and are bringing our daughter home in April...this all happened on our first trip to visit her, and as our church had some adoptive parents going through the process in Haiti, it has really hit home!! I too have never felt such distress over the situation...IT IS CRITICAL for God's people to stand in the gap for these little ones, who have NO VOICE! We're praying for Haiti! Praying along with you and thanking God for people like you.